DEISIGN: DEISIGN at Bogotá ACM SIGGRAPH 2012! 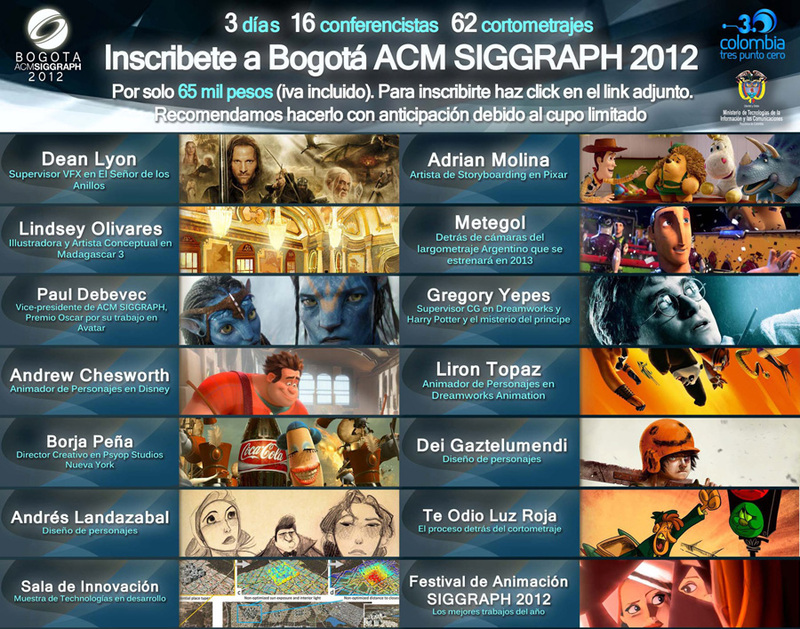 DEISIGN at Bogotá ACM SIGGRAPH 2012! So it turns out I have been invited to fly over to Colombia to do a presentation at this year's Bogota ACM SIGGRAPH!! The image above speaks for itself and the guest line up probably gives all of you a pretty good idea of how I feel right now. In the morning of October 25th, I will be doing a presentation on Creature Design. I am currently creating an original "twisted forest fairy" design from scratch in order to give the audience an insight into my approach to designing creatures. I am also recording all of this creative process and will eventually share it with all of you as well, here at DEISIGN. Thank you very much for your interest and support. Wish me luck! PS: Needless to say, if any of you will be at the event, be sure to let me know! In fact, there will likely be a workshop after the weekend for anyone interested in one on one feedback, tips and exercises. Hasta la vista! Maletan lekua egidazu... a! ez, barka, ahaztuta negoen, substantzia arriskutsuak ez dira baimenduak.. he, he. Dani Fano osoa ez zait kabituko, baina Xabiroien ale batzuek bidaiatuko dute hara... beraien bitartez bizitzeko eta sentitzeko gai dela Dani Fano diote kondairek.